TVT Green Grease Formula is a major breakthrough in lubrication technology to fight friction and wear on bearings and other moving parts found in heavy equipment and motor vehicles. 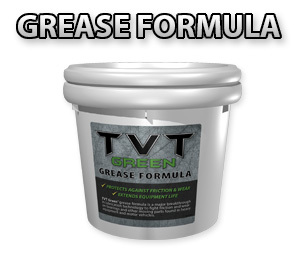 Use TVT Green Grease Formula as you would any other grease to lubricate bearings and other moving parts found in heavy equipment and motor vehicles. Available in 3, 7 and 35 lb. containers. Not a hazmat reportable product. © 2014-2016 Modern Spartan Systems, Inc.